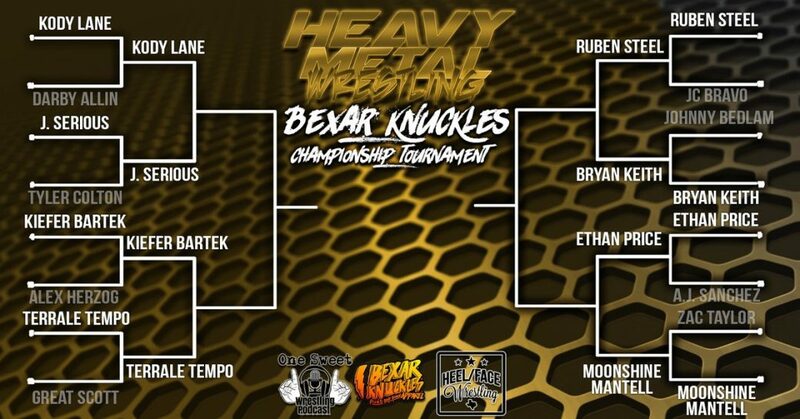 As the BEXAR KNUCKLES CHAMPIONSHIP TOURNAMENT continues, we’ve just wrapped up the First Round and the very foundation of Heavy Metal Wrestling has been shaken! The favorite to win the tournament, DARBY ALLIN, the talented underground icon from EVOLVE, was eliminated in the first sound after being defeated by KODY LAND. As was Heavy Metal Wrestling’s resident dirtbag, GREAT SCOTT when he was bounced from the tournament by his arch-nemesis TERRALE TEMPO! With just 8 men remaining in the field, who do YOU think will be crowned Heavy Metal Wrestling’s first Champion?